Lynn wants to comfort and be there for Jennifer, but Anissa wants to give her space. Anissa is shot after a militia group tries to kidnap Lynn; the A.S.A. stops the kidnapping attempt. Anissa survives the attack. Jennifer's powers start overreacting after seeing a photo of Khalil at his home. His mother can't afford to bury Khalil. The A.S.A. and Odell are tailing Lynn. Gambi does a sweep of tracers but the area is clean. Later at the lab, Lynn lies about Anissa fainting; Odell is mad that Lynn is still lying to him. Todd is looking after the powerful metahumans in the pods. Anissa comforts Jennifer over the loss of Khalil. Lynn is worried that Jennifer is craving vengeance for what happened. Tensions flare-up between them. Jennifer asks Jefferson to join the fight against Tobias. She wants to suit up and be a superhero. Jefferson argues against this; he doesn't want Jennifer to be ruled by her emotions. Odell tells Dr. Jace that the Markovians tried to kidnap Lynn; they want her metahuman expertise and the pod kids. Odell offers Dr. Jace a deal: if she can moves the pod kids to safety, she will be granted immunity. However, Dr. Jace needs Lynn's help to move the pod kids. Lynn doesn't regret being with Jefferson. They make amends. Anissa returns to work at the clinic; her latest patient Monique has a lot of strange marks that look like someone attacked her. Monique pretends that it was caused by a blackout. A nurse tell Anissa that Monique's attacker is her boyfriend Rayvon; he's a capo for the 100. The Markovians try to kidnap Perenna. She uses her powers to incapacitate them into thinking that they're freezing on a mountain. Jennifer goes back to school. The students and faculty greet her with happiness. Grace has comics for Black Lightning and Thunder from a local comic books store. Anissa is impressed by the selection. Jennifer is sad while looking at the school's mural for Khalil. Her powers nearly flare after the janitorial staff starts taking down the mural. Anissa, as "Blackbird", breaks into Rayvon's apartment to beat up the goons and steal his money. She sends him a message to stop hitting women and she fights his cronies. After one of them gets the upper hand with mace, they attack her and leave her bruised. She knocks them out before they can deal more damage. Gambi tries reasoning with Anissa to not risk her life. Jennifer sets up a small memorial for Khalil at the school. Principal Lowry threatens to expel Jennifer if she doesn't go away and turn it down. She stands up to him and calls him an uncaring racist. He has her removed, but the students stay as protest. Jefferson doesn't help Principal Lowry. Odell brings Dr. Jace to the lab; he needs Lynn to help with moving the pods. Anissa drops off the money for Khalil's funeral. Gambi finds the whereabouts of the Markovian driver; he sends Black Lightning to apprehend him. Black Lightning fights the criminals and takes the driver. Monique left Rayvon and is starting a new life. Principal Lowry reveals to Jefferson that his father was a heroin addict and he had to sleep on the streets as a kid eating dog food. Grace's eyes change colour in front of Anissa. After Anissa invites her to meet her family, Grace's skin starts changing; she walks away in fear. The people inside the powerful pods are agents from the Libonworth attack from the past. The Markovian driver had diplomatic immunity; he is freed by Henderson. Jennifer refuses to leave the limo; she isn't ready to see Khalil lowered into the ground. 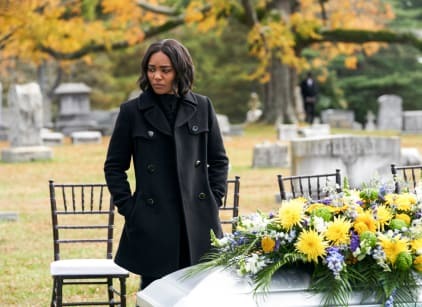 Jefferson convinces her to attend the funeral. Khalil's mother breaks down at the casket. Anissa returns to the apartment and finds Grace's stuff missing. Tobias wants Todd to free the murderers from the pods, but he doesn't know how to use the technology. Tobias wants Dr. Jace brought to their lab. Jennifer vows to kill Tobias. Odell watches her from the distance.